If you have questions about your eligibility, please contact the U.S. Department of Veterans Affairs. For a full list of eligible benefits, visit the Georgetown Veterans Office website. Approved certificate programs are eligible for funding through the Department of Veterans Affairs (VA) education benefits (hybrid certificate programs are not eligible). For questions regarding our programs or the benefits process, please contact the Georgetown Certificates VA Certifying Official at (202) 784-7321 or ccpevabenefits@georgetown.edu. If appropriate, contact the VA to determine your eligibility. Create your Georgetown student profile. There is no cost to create your profile. Prior to registration, complete the VA Benefits Request Application Form and upload a copy of your Certificate of Eligibility using the upload widget below. Our office will not process your registration until your application is complete. Post-9/11 GI Bill® and Vocational Rehab. : Select "Veterans Benefits" as mode of payment at time of registration. No up-front payment is required. Montgomery GI Bill: You must pay course balance prior to the start of each course by credit card. Select "Credit Card" or "Payment Plan" —do not select "Veterans Benefits" as method of payment at time of registration. You will receive monthly reimbursement from the VA depending on your eligibility. Your enrollments will be reported to the VA by the Certifying Official as soon as possible. It is your responsibility to report any changes in your enrollment (withdrawing or transferring) or status to the Certifying Official. 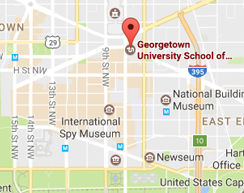 **The Yellow Ribbon Program will cover 100% of Georgetown University School of Continuing Studies (SCS) tuition for up to 45 undergraduate credits per year or up to 30 graduate credits per year. Certain fees are not covered. Eligible Certificate Programs and the Doctor of Liberal Studies (DLS) degree are covered by the GI Bill but not by the Yellow Ribbon Program.